Home / EN / Finance / KTC / Sports Revolution / “KTC” joins hands with “Sports Revolution” in launching the “KTC-REV” Credit Card, the first in Thailand to target sports and exercise lovers. 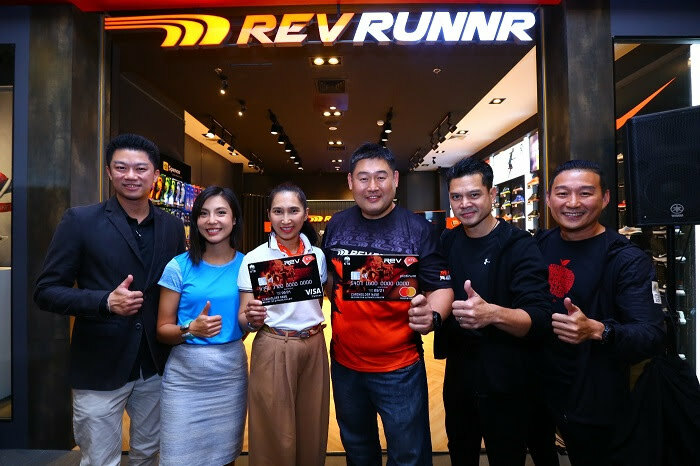 “KTC” joins hands with “Sports Revolution” in launching the “KTC-REV” Credit Card, the first in Thailand to target sports and exercise lovers. “KTC” penetrates the market in a segmentation move in partnership with “Sports Revolution”, importer and distributor of leading sporting goods brands, in releasing the “KTC-REV VISA Platinum” and “KTC-REV Platinum MasterCard” Credit Cards, the first in Thailand to target and compliment the lifestyles of sports and exercise lovers. The credit cards are distinguished for its promotions and special privileges that cater to customers’ needs. KTC aims to expand its customer base by focalizing on customers who love to engage in all sorts of exercises. KTC forecasts an increase of over 20% in overall Credit Card spendings in the Sports category and releases the “The Ultimate Experience to Break Your Limits” campaign, drawing influencers to share their experiences through social media, encourage Thais to break their personal limits and exercise more. Ms. Sireerat Corvanich, Vice President - Credit Card Business, “KTC” or Krungthai Card Public Company Limited, states, “Thais nowadays increasingly give more importance to sports and exercises and the sport style attire trend are also popular, causing continuous overall credit card spendings in the Sports category for the past 4 years. In 2018, KTC laid out a marketing strategy to expand the customer base to include those that truly love sports by partnering with “Sports Revolution” alliance, importer and distributor of leading sporting goods brands, such as ASICS, NIKE, Under Armour, REV RUNNR, VIBRAM, HOKA, SOFSOLE, etc. with over 102 branches countrywide, in launching “KTC-REV VISA Platinum” and “KTC-REV Platinum MasterCard” Credit Cards,to select outstanding special privileges that caters to the sports lovers community. 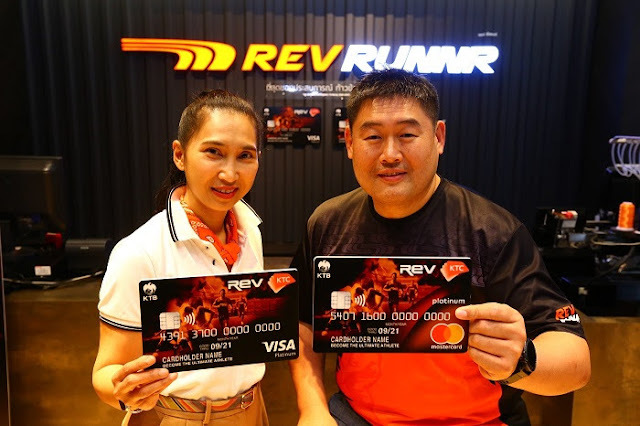 “Besides special privileges that come with VISA or MasterCard credit cards, “KTC-REV” Credit Card cardholders also receive additional privileges for stores operating under “Sports Revolution” including participating renowned brands, such as 10% discount off regular priced participating products for purchases of 3,500 baht or more, as well as other privileges at affiliated alliances, such as PROBIKE, major distributor of bikes; WE Fitness, physical fitness club for modern Bangkokians; hotels under the ONYX network; the Bangkok Academy of Sports and Exercise Medicine (BASEM) and HERTZ, worldwide car rental services. In response to the launch of the “KTC – REV” Credit Card, KTC is confident of the positive reception which will result in an increase of over 20% in overall credit card spendings in the Sports category at stores under the “Sports Revolution” network. Mr. Pornsak Shinwongwattana, Chief Executive Officer, Sports Revolution Company Limited, states, “Sports Revolutions is a leading imports and distributor of sporting, lifestyle goods and fashion including sportswear and footwear, with a business value of 2 billion baht. Sports Revolutions’ main strategy is to differentiate the imports of new products to diversify the variety of goods and to provide specialized goods to target groups. Our aggressive marketing plan for 2018 centralizes on reaching customers who love exercise and to encourage them to exercise more. We partnered with Krungthai Card Public Company Limited or “KTC” in launching the “KTC-REV” Credit Card to expand new customer bases to include KTC members. Special privileges that customers will receive after registering for the credit card will also create loyalty that will encourage customers to return for services at our stores and make more repeated purchases of brands under our network”. Moreover in 2018, in order to create a variety of products and cater to the needs of specific groups of customers, executives and staffs follow the belief, “The Great Performing Athletes is always driven by the great sport gear”. As a result we have a policy that stresses customer service; we trained staff to attain knowledge and special skills to become “Brand Product Specialists”, in order to provide accurate product advice that suits the uses of individualized customers. This service is especially emphasized at REV RUNNR, a store for specialist running with products from multi brands that create interest in the market, including HOKA, ALTRA, VIBRAM, SOFSOLE, BALEGA and SKINS. We focus on the creation and passing on of experiences by exchanging perspectives of those that loves running, from amateurs to national team athletes. Anyone can receive consultation from our staffs regardless of their ways of running. 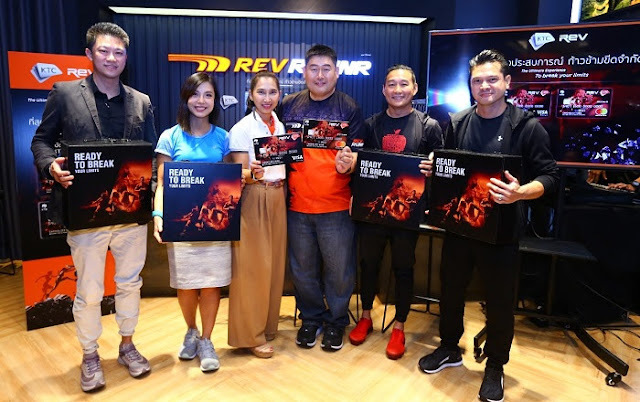 “Besides this, Sports Revolution and KTC also increased their aggressive marketing plan in 2018 by jointly creating the “The Ultimate Experience to Break Your Limits” campaign, by selecting representatives of experiences, including Mr. Neung Srarun Limsawatwong, a businessman who turned his life around from a cancer patient to a world marathon runner; Mr Neung Kittipong Kertwiboonvet, sports shoe collector and owner of the OUT RUN page; Miss Argaree Keatfeaungfoo, winner of the Ironman competition and Mr.Tao Somchai Kemklat, top actor and his new role as a marathon runner, to present, “4 Ultimate Experiences to Break Your Limits” in the form of a “Viral Clip VDO” through social media to pass on inspiration to other people. The video is set to launch for the first time on January 9, 2018. Along with this, “9 Experiences 9 Inspirations to Break Your Limits” were also organized in the form of a “Quote Article” from exercise lovers including, Khun Kritapong Chawaldit from SB Furniture; Khun Bae Malinee from Konplangrang TV Program; Khun Thanongsak Supasap, veteran singer and actor; Khun Sup Wiwat from Superjiew TV Program; Khun Ta Pipoo, famous news reporter; Khun Micky from The Face Men Thailand; Khun To Reaungyos tough runner; Choch Krasun ; man on a wheelchair who did not give up on his destiny; Khun Mhee Jiranarong, Art Director at a day magazine and 40 other renowned influencers from various fields that partook in the creation of inspiration in this occasion with the same goal to motivate Thai people to break their own limits and to encourage people to pay more attention to their health by exercising and playing sports for better health. “We hope that overall sales of Sports Revolution Company Limited will increase an additional 20-30% from this campaign strategy, with hopes that customers will get easier exposure to products. Along with staffs’ knowledge and expertise that accumulated over 17 years, the company is certainly confident that it will create inspiration that will lead to good experiences from the usage of great products”. Mr. Pornsak says conclusion. For more information, please contact KTC PHONE 02 123 5000 or visit www.ktc.co.th/ktcrev, register for a credit card at any “K TOUCH” branches and participate in activities that create experiences that break your limits at Facebook: Sports Revolution or Line@:SportsRev and get updates on news and special products for runners at Facebook: REVRUNNR IG:@REVRUNNR.